The soil on Mars is high in iron. The color of iron is red. Hence, Mars is red. Contrary to popular belief, the color of Mars is not entirely red. In fact, technically it is not even red. It just appears to be red, whereas it actually is a reddish brown. From up close, the ground even appears to be a butterscotch color. In addition to these colors, some of the other colors that patches of Mars appear to be are golden, brown, tan, and greenish. 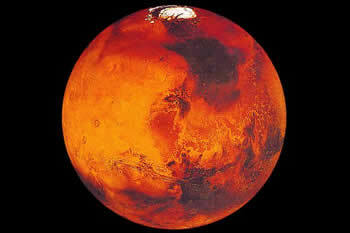 The reason that Mars appears to be red is due to the fact the ground of Mars is covered with a fine powder. This powder is high in iron. While iron is not red, it tends to rust when it comes into contact with oxygen. As rust has a reddish appearance, so does the entire dust covering. However, in areas that the dust has less iron content and a higher content of other minerals, the color of that region will be different than the characteristic red. This oxidized soil is the top most layer of Mars’s ground. It is only a few millimeters to two meters deep. Once this dust is disturbed or removed, the ground of Mars is more brown than red. Still to us, Mars is and always will be the iconic Red Planet. Occasionally this dust is blown across the sky by winds, leading to red sand storms. In fact, even the sky on Mars is red. This is due to the fact that this dust scatters the red photons of light in the sky, which basically means that the dust particles reflect and refract the red wavelength of light. Hence, making the sky appear to be red, this is similar to the reason why Earth’s sky appears to be blue.